Senior Lecturer in Rheumatology, based in the Musculoskeletal Group, Institue of Inflammation and Repair. Also Honorary Clinical Consultant at The Rheumatic Diseases Centre, Salford Royal NHS Foundation Trust. The academic component of my job is HEFCE funded and the clinical component funded by the trust, the split being 50:50. My primary research interest is in the investigation of genetic and environmental risk factors in inflammatory muscle disease, or myositis. This is complemented via the Salford Royal Adult Neuromuscular clinic, where patients are clinically managed within an NHS Specialised Rheumatology service and recruited into ongoing research studies. Dr Hector Chinoy is a Senior Clinical Lecturer in Rheumatology at The University of Manchester, UK, where he conducts an active programme of research, is the Clinical Rheumatology MSc Programme Director, and is also an Honorary Consultant Rheumatologist at Salford Royal Hospital. Dr Chinoy completed his medical degree at the University of Nottingham in 1996 and completed an Arthritis Research UK PhD fellowship at The University of Manchester. He has research interests in genetic, epidemiological and clinical aspects of adult idiopathic inflammatory myopathy, as well as immunogenicity of biologic therapy, and supervises a number of PhD and Masters students. He is principal investigator of a UK Medical Research Council funded prospective myositis cohort collection called MYOPROSP. 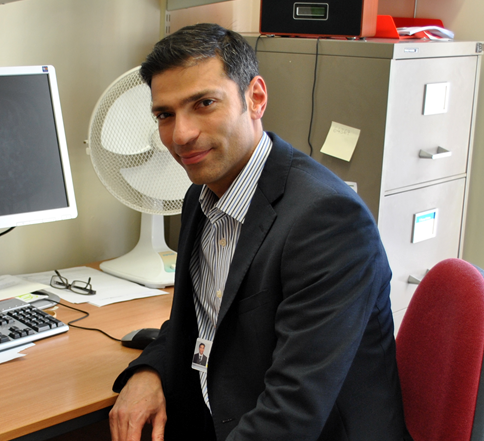 At Salford Royal, he runs general rheumatology, adult neuromuscular and combined psoriasis/psoriatic clinics. He is a reviewer for several major rheumatology peer-reviewed journals, advisory editor for Arthritis and Rheumatology, on the editorial board for the European Medical Journal and Reumatologia, and is on the abstract selection committee for the British Society for Rheumatology, European League Against Rheumatism and American College of Rheumatology annual conferences. He is co-chair of UKMYONET, a national consortium that fosters collaborative research in inflammatory myopathy, chair of the Euromyositis registry, a consortium that collects standardised clinical data in over 30 countries. Dr Chinoy is also the Royal College of Physicians representative for the NHS England Specialist Rheumatology Clinical Reference Group. What is new in the treatment of myositis?